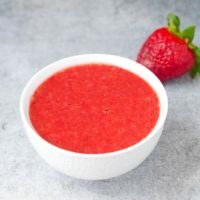 This easy no-cook strawberry sauce recipe comes together in just a few minutes and is a great topper to many things like pancakes and waffles, ice cream, and even in drinks like tea and smoothies. As I’m sure I’ve mentioned before, one of the things I look forward to most come spring is all the fresh produce that starts coming in, especially berries. One of the first berries to be in peak season are strawberries. Ever since I can remember, we’d buy fresh strawberries almost every week at local strawberry farms during the season, yet I never would grow tired of them. We’d eat them fresh, but also make them into strawberry jam, strawberry pie, strawberry ice cream, and all sorts of other strawberry recipes. Today, I’m sharing my easy no-cook strawberry sauce recipe that’s great on pancakes and waffles, cake, ice cream, in your breakfast smoothie and so many other things. 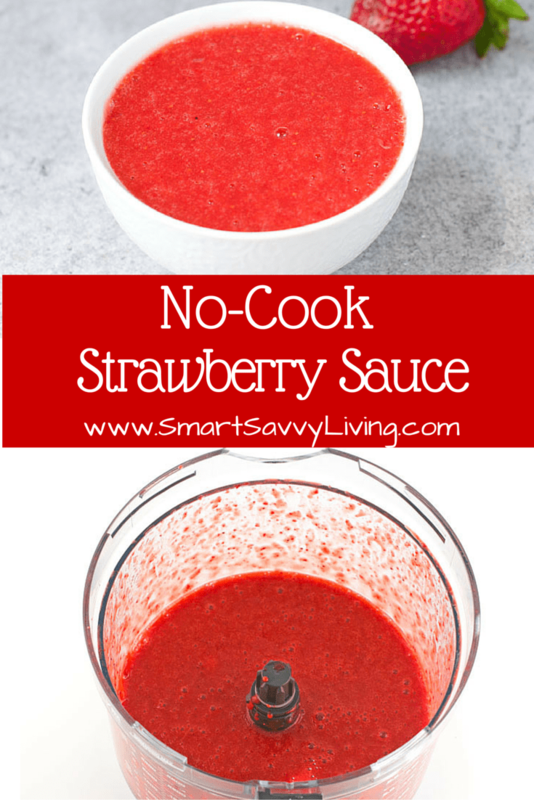 I especially love this no-cook strawberry sauce because it comes together so quickly and you don’t even have to turn on the stove, which is pretty much the last thing I want to do as the weather starts getting hot. Because the strawberries aren’t cooked, it does have a bit more of a floral and fresh taste than a sweeter taste like a cooked sauce, which is something I rather like about it. Since it’s a smooth, pureed sauce, you can also use it in several different ways from the traditional pancake and ice cream topper, but I find it’s also a great way to add a bit more flavor to thinks like iced tea, your morning smoothie, or even just plain water. I like keeping a squeeze bottle (these come in so handy) of it in the fridge during strawberry season so it’s always ready to go. If I bought a few too many strawberries and don’t have the freezer space, I’ll even make some of this strawberry sauce and pour it into mason jars to give to friends. 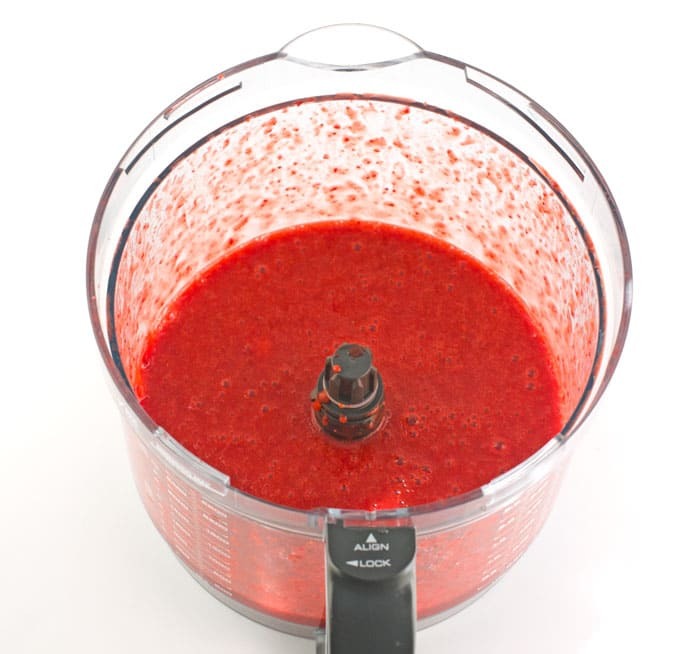 I make this strawberry sauce recipe in my beloved Breville food processor, which is a bit pricey compared to many other brands, but it is SO worth it. It comes with several different blades, works like a dream, and is even very easy to clean. I have to admit, when I had other brands of food processors, I rarely used them because they really weren’t worth the effort, but since getting the Breville I use it several times a week. 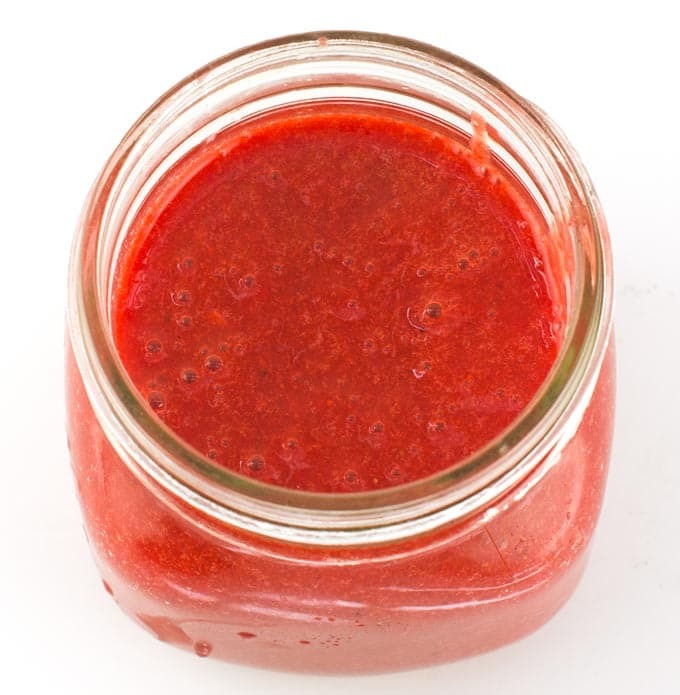 You can also, of course, make this homemade strawberry sauce in a blender. Here’s how to put this easy no-cook strawberry sauce recipe together. 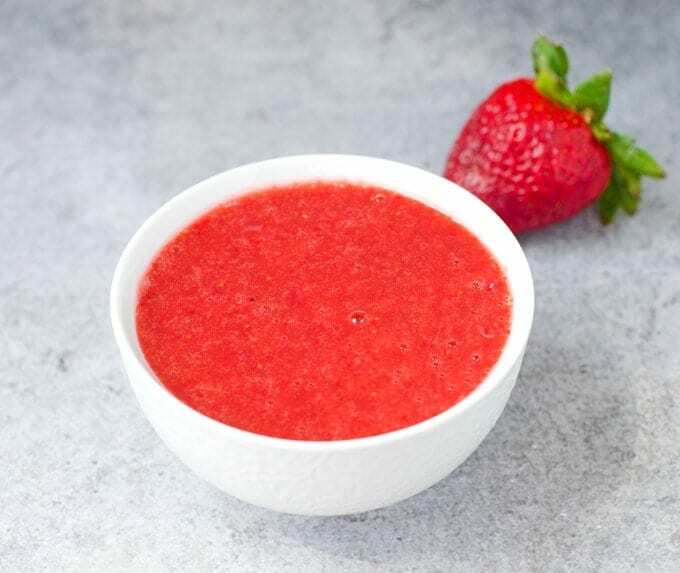 This no-cook strawberry sauce comes together in minutes and can be used as a topping or to flavor beverages. 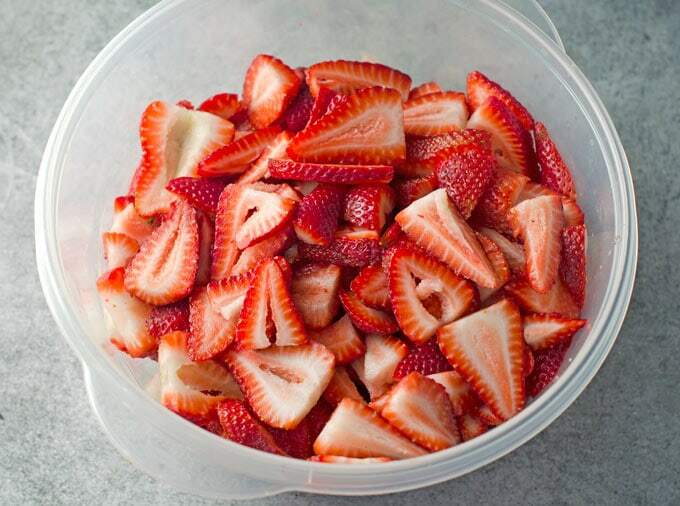 Wash strawberries and gently dry, then hull them (take off the green part of the strawberry). Place the strawberries into a food processor fitted with the chopping blade or a blender. Add sugar or honey, lemon juice, lemon zest, and salt to strawberries. Process the ingredients until everything is thoroughly combined and smooth. You may need to use a spatula to push the larger chunks of strawberries down between pulses. Taste for desired sweetness. Pour into a jar or squeeze bottle, cover, and refrigerate for up to 5 days. If you are concerned about the seeds, you can run it through a fine mesh sieve first. Use as a topping on things like ice cream, waffles, pound cake, or pancakes. I also like to add the sauce to water, tea, smoothies, etc. I haven't tried it but frozen strawberries should probably work as well. I would thaw and drain them first, though.